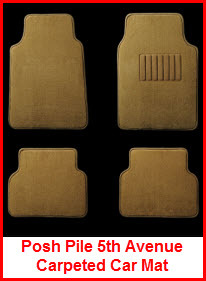 Highland Car Mats are made from long lasting & very durable rubber. Highland Car Mats are distributed by, of course, Highland. Highland is a product line of Cequent Consumer Products, Inc., which in turn is a division of TriMas Corporation. Highland was founded in 1945 by the Grobowski Family and developed the world's first aftermarket splash guards. The company evolved into the manufacturing, importing and distribution of all kinds of cargo management and garage organization products, many of which you can still purchase today. 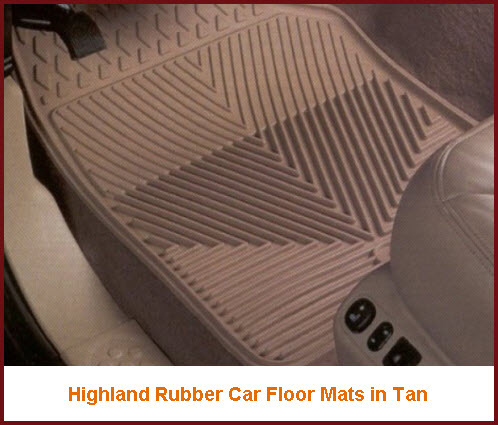 Highland distributes Universal Fit Carpeted and Rubber Car Floor Mats, and, Custom Fit Rubber Car Mats. The custom fit side of the product line is represented by Highland All Weather Mats while universal fit aficionados will be ecstatic with Posh Pile Universal Car Floor Mats that come in both carpet and rubber flavors. Here's some info on both the carpeted and rubber product line of Highland Car Mats. Tip: use a universal absorbent car floor mat protector to further protect your cars floors and carpeting. Cequent (Highlands parent company) announced in December 2012 that it would begin distributing the Posh Pile Brand of Rubber and Carpeted Car Floor Mats. The Posh Pile brand line includes two carpeted car mat offerings, the 5th Avenue and the Pacific Coast Highway. The 5th Avenue: This is the Ultimate Posh Pile Carpeted Car Mat. It's luxurious, thick carpet keeps your feet warm and dry while making your Pinto feel like a Rolls. A long wearing nylon heel pad is woven into this mat to prevent wear through from the heel of your shoes. The mat edges are woven to prevent unraveling. UV and stain resistance are standard. There's a TPR rubber non-skid backing reinforced with nibs to prevent the mat from slipping on your vehicles floor. Colors include Tan, Grey and Black. Wash up with mild soap and water. The Pacific Coast Highway: This mat uses 18 ounce needle punch pile carpeting to provide a luxurious, yet thrifty experience for the discerning individual. A quality, waterproof, PVC non-skid backing with nibs and woven edges give you luxury features at a value price. Available in Tan, Grey and Black. Wash with mild soap and water.